If you want to see as many castles as possible in the least amount of time in Germany, take a ride on the Castle Road, one of Germany's Best Scenic Drives. This themed route is lined with 70 castles and palaces, enough to make you feel like a King (or Queen). The Castle Road, called Burgenstraße in German, is over 1,200 km (745 miles) long. It starts in Mannheim and leads you all the way to Prague in the Czech Republic. It is - of course - dotted with castles and picture-perfect around every corner. The closest international airport with direct access to the Castle Road is in Nuremberg (airport info for NUE). However, it is a smaller airport and international flights usually arrive in Munich, Frankfurt am Main or Stuttgart. From there, you can either take the Intercity Express (ICE) to Mannheim, Nuremberg, Heidelberg, or Bamberg, where you can start your castle tour. You can also rent a car from any major city center or transportation center. Read about all your options for getting around Germany. By car: The Castle Road consists of a series of small, winding back roads with easy to follow signs. Along the way, you pass several rivers and drive through spectacular landscape. You reach the route from the following Autobahns (motorways): A3, A5, A6, A7, A9. By train: Almost all towns along the route have a train station, and the train mostly travels parallel to Castle Road. The website for the Castle Road is in English and has different route maps which include castle and driving information. It also helpfully points out which castles house restaurants or hotels. 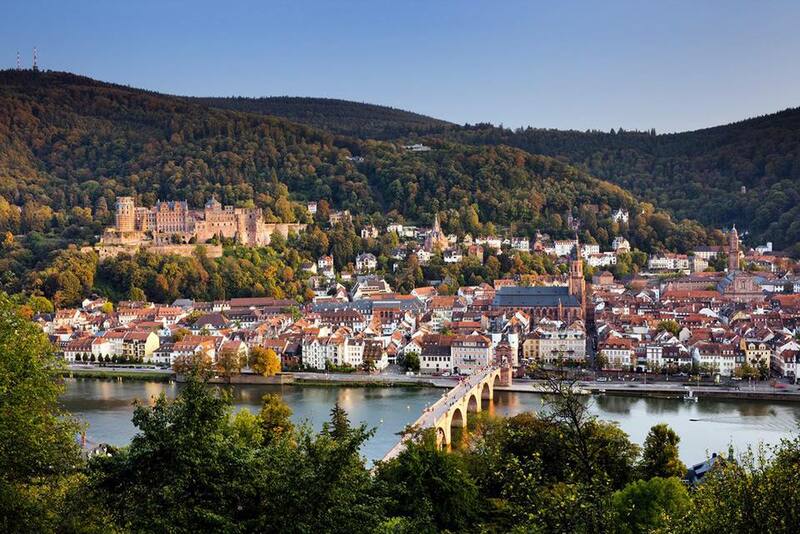 Castle of Heidelberg: Perched above the bustling student city of Heidelberg, the picturesque ruins are a major attraction. Bamberg: With a UNESCO old quarter and robust beer scene, the castle is just of the attractions of the city. Rothenburg ob der Tauber: The best-preserved medieval town in Germany. Walk the ramparts and visit the terrifying torture museum. Castle of Neuenstein: Home to the aristocratic line of Hohenlohe-Neuenstein, the site has a museum and beautifully decorated rooms like is its original medieval kitchen. In the summer, there is a concert series on the premise. Imperial Castle of Nuremberg: The castle and its impressive city walls are considered one of Europe's most formidable medieval fortifications. The town also features the best Christmas market in Germany. New and Old Palace of Bayreuth: Margrave Georg Wilhelm's wife Wilhelmine is responsible for the stunning Japanese Cabinet and the Chinese Mirror Cabinet. Outside, visitors can explore the court gardens. The town is also famous for its annual Richard Wagner Festival. Veste Coburg Citadel - This castle from 1056 was once the refuge of Martin Luther took refuge and today showcases Luther room, bear enclosures (yes, really) and museum. There is never a bad time to take the castle road. During the summer (late May to September) and around Christmas are high season. But throughout the year the castles put on different events from period costume performances to music festivals to ghost tours. Check the schedule for special events and partake in the regular guided tours and open grounds. Experience medieval times belly first by dining at some castles' cafe and restaurants as well as occasional banquets. You can even sleep like a king by staying in one of the many magnificent castle hotels. With so much to see on the Castle Road, it is recommended to pick just a few castles that you want to explore in depth. Enjoy the view of the other castles from afar. If you want to drive the whole route, you will need at least 3-4 days. You can spend the night in some castle hotels to get the full experience. A great place is the 1000-year-old Castle Hotel Colmberg. If you want to save some money, look out for Pensions (bed and breakfasts) along the way. Their signs will say Zimmer frei (rooms free).